The figures on the left are lit from above by a heavenly glow. The figures on the right are in increasing darkness. There is a black candle on the table that is providing a little yellow/orange light reflecting of people, clothing & objects on the table. Un-named people. On the left there is a Christian man (with Bible in hand) & woman talking to a man on the extreme left of the scene. 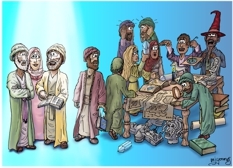 There is a man turning away (figuratively representing someone turning away from Christianity) the remaining people around the table represent people who are intrigued & absorbed in all kinds of myths, magic & distractions. This is a visual representation of verses 3 & 4. The scene should be “read” from left to right. On the left there is a Christian man (with Bible in hand) & woman talking to a man who stands on the extreme left of the scene. He represents someone who is interested in hearing the Gospel of Jesus the Christ, but who is not yet a believer. Although I have the Christian man holding a Bible, the book of the Bible didn’t actually exist at this early time in church history. 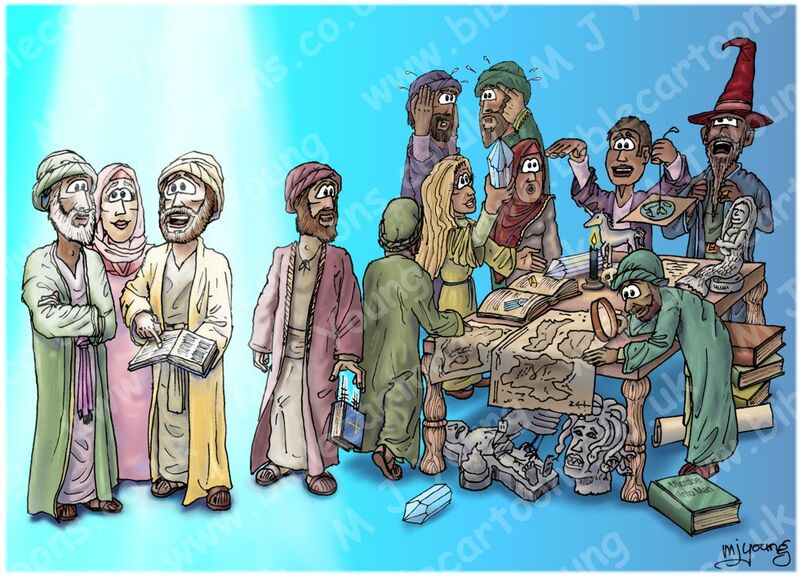 Nevertheless I have illustrated the man holding a Bible (in bound book form), as a symbolic reference to his faith: the easiest way to visually identify a Christian in my work is to have a person carry a Bible, even if they didn’t exist yet! 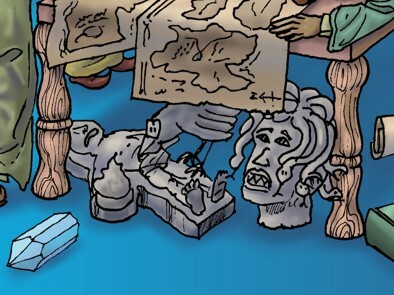 01) Under the table there is a statuette of Prometheus, who is a character from Greek mythology. He stole fire from the gods & gave it to mankind. For his trouble he was chained to a rock by the chief god Zeus, where an eagle ate his eternally replenished liver every day. 03) There are 3 crystals in the scene, one on the ground, one on the table & held by a blonde woman. Crystals have been attributed with all sorts of powers, through history. 04) On the ground are a variety of scrolls, maps & books. Only the green book, in the foreground has a title that can be seen: “Microbes to men”. The book represents all the ideas about evolution from simple life (single celled) to complex life; from one form developing into another, leading to mankind. 05) The man in green & holding a magnifying glass is studying various maps. He is looking for Atlantis, a fabled island in the Atlantic that according to legend sank beneath the sea. 06) On the table is a black candle & a skull, which represents the dark arts of magic, the occult, Satanism, etc. 07) There are two other statues (on the table) one of a unicorn & one of a mermaid. The unicorn is a mythical animal generally depicted with the body and head of a horse, the hind legs of a stag, the tail of a lion, and a single horn in the middle of the forehead. A mermaid is a fabled marine creature with the head and upper body of a woman and the tail of a fish. 08) Behind the mermaid statue is a man wearing a pointed red hat & looking like he is lecturing anyone who will listen! He represents people interested in magic (witches, wizards, warlocks, etc) & who practice these dark arts. 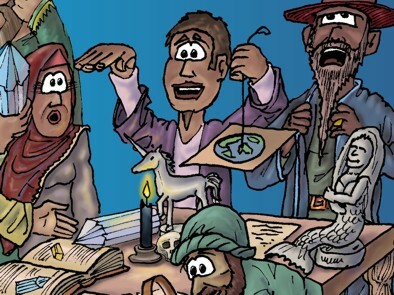 09) To the left of the “wizard” is a flat earth proponent: even today there are people who don’t believe the Earth is a sphere in shape, but that it is flat. The man is holding up a string, which suspends a flat map of the earth. He is holding his right hand up (flat, of course!) & is trying to convince anyone who will listen about his idea. I’m sure I could have represented many more myths, legends, philosophies & ideas than these. There are plenty about, & always have been. Ultimately all these things have one thing in common: they are deliberately postulated & made popular with the express (satanic) purpose of drawing people away from “sound doctrine” (verse 3.) For a definition of doctrine, read my note below . The process appears to start with dis-satisfaction with the sound doctrine found in the Holy Bible. People who are in danger of abandoning their Christian faith become discontent; already “their own desires” are at work within them, & the saving power & life-giving Word of God (the Holy Bible) is “not enough” for such people. 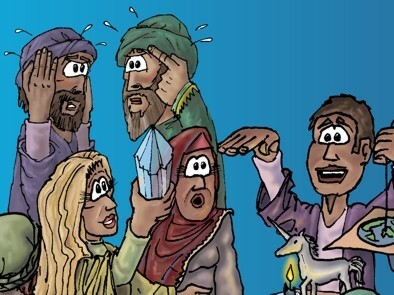 Instead of reading the Bible & putting it’s truth to work in their lives, such people become enamoured with some other “truth”, be that crystal healing, magic, occult practices, New Age philosophy, or any number of other ideas. Then “they gather around them a great number of teachers to say what their itching ears want to hear.” If someone rejects the message of Jesus, they will always want to replace the real Truth, with a lot of other “truth” to drown out the Holy Spirit’s insistent voice, calling them to repentance. The fact is that there is no other way to heaven/God the Father than through Jesus the Christ. That’s what the sound doctrine of the Bible points out. There is no other “truth” than the revealed Truth of the Holy Bible. This is part of a definition of doctrine that I found online.